Two protesters were killed during anti-government demonstrations that rocked Sudan’s capital in the past day, police spokesman General Hashim Abdelrahim told AFP early Friday. Hundreds of protesters took to the streets in Khartoum and its twin city of Omdurman on Thursday as demonstrators launched simultaneous rallies in several Sudanese cities and towns calling on President Omar al-Bashir to resign. 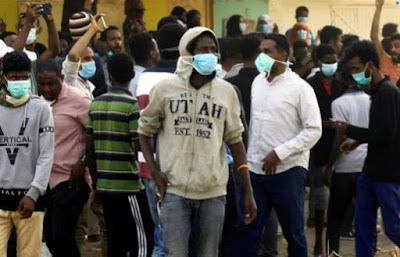 “There were several illegal gatherings in different states and also in different areas of Khartoum state,” Abdelrahim said. “Police dispersed them with tear gas. In the state of Khartoum we have recorded two deaths,” he said, without specifying how the people died. Late Thursday, a senior Sudanese official reported that one protester had died in a protest in Omdurman. A doctors’ committee linked to the Sudanese Professionals’ Association that is spearheading the protest campaign also said two protesters had died on Thursday. The overall death toll since the protests erupted in December has now reached 30, according to officials. Rights groups have put the death toll at more than 40. Abdelrahim said police had arrested several people on Friday and charged them with “disturbing public law and order”. Police had also detained an individual who was carrying a pistol in a demonstration, he said. A car equipped with “long distance communication equipment” was also captured, he added. Deadly protests have rocked Sudan since December 19 after a government decision to triple the price of bread. The protests swiftly turned into nationwide rallies, with angry demonstrators calling for an end to Bashir’s three-decade rule.